Silvasorb Dressings: Silvasorb Harnesses The Power Of Ionic Silver, Releasing Silver At A Controlled Level For Broad Spectrum Antimicrobial Action, Without Harming Tissue Cells. The Ionic Silver Is Suspended In The Silvasorb Dressing To Control Its Release Over A Period Of Up To Seven Days. It Offers Antimicrobial Protection Over A Broad Spectrum Of Bacteria And Fungi, Including Mrsa And Vre. Silvasorb Kills Microbes, But Is Completely Biocompatible With The Tissue Cells Of Healing. In Addition To Controlling Bioburden, Another Key Factor In Wound Healing Is Managing Moisture Level. Silvasorb Dressings Are Made Of Special Polymer That Absorbs More Than Five Times Its Weight In Fluid. That'S Not Only More That All Other Silver Dressings, It'S Several Times More Than Calcium Alginates Or Similar Absorptive Products. This Allows Silvasorb To Be Left In Place For Longer Periods Of Time Compared To Other Wound Dressings, Even On Heavily Draining Wounds. If The Wound Is Dry, Silvasorb Can Help. The Dressings Are 20% Water, Giving Then The Unique Ability To Donate Moisture When Needed. Advanced Fluid Management Helps Provide A Moist Wound Healing Environment For The Full Spectrum Of Wounds. Silvasorb Will Not Dry Out A Wound And It Will Not Macerate The Surrounding Skin. Silvasorb Is Available In Four Formats: Sheets For Flat Wounds With No To Moderate Exudate; Perforated Sheets For Flat Wounds With Moderate Exudate; Cavity Strands For Deeper Wounds Of All Exudate Levels; And Gel For Dry Wounds. 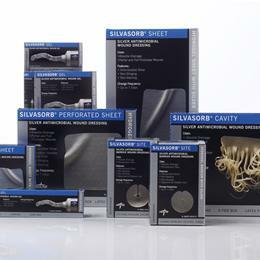 Silvasorb Sheets For Flat Wounds With Dry To Moderate Exudate 4.25" X 4.25".